Former trade unionist Antti Rinne is poised to become Finland’s first Social Democrat prime minister in 16 years, winning by fewer than 7,000 votes. But he faces a tough set of coalition talks, after the ultra nationalist Finns Party came in second, beating the conservative National Coalition for the first time. The Center Party of outgoing prime minister, Juha Sipila, suffered a bitter defeat as voters punished his tough labor-market policies and failed healthcare reform. A recount in the Satakunta region could still sway the final tally and potentially result in an equal number of seats for both the Social Democrats and the Finns Party, Iltalehti reported. It won’t be clear until Wednesday what the final outcome was. Rinne sought to play down fears of protracted government talks, saying he targets a coalition by the end of May. In neighboring Sweden, it took four months for parties to agree on a coalition after inconclusive September elections. The 56-year-old Rinne has promised to end four years of policies that included wage cuts and longer working hours. Sipila, who had resorted to those measures in an effort to drag the euro zone’s northernmost economy out of a deep recession, suffered a fatal blow to his popularity earlier this year when he failed to pass a vital package of bills needed to reform healthcare. Rinne said he won’t back away from his party’s demands for higher spending to make sure enough people are working in Finland’s care industry. “In contrast to the Sipila government, we can’t accept policies that force people who are worse off to pay for stabilizing government finances,” Rinne said in an interview on Sunday. Meanwhile the Finns, which campaigned on an anti-immigrant and euro-skeptic platform, are now firmly planted in the mainstream of Finnish politics. The result is in keeping with developments across the rest of the Nordic region, where parties arguing against letting in more foreigners have managed to dominate the political debate. Halla-aho’s party ran an aggressive campaign, winning back support lost after the group splintered in 2017 as more moderate elements left. Its anti-immigration message resonated with voters. The Finns Party also seemed to benefit from an attack on what it characterized as the liberal elite’s obsession with climate change. 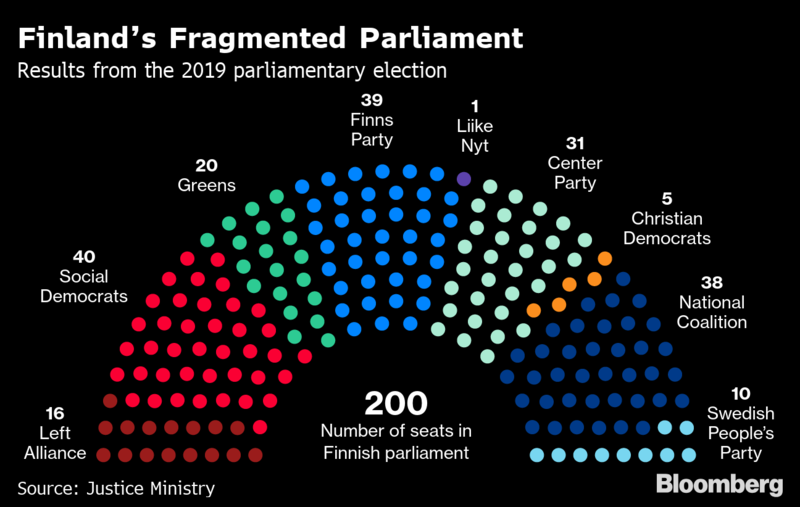 So far, most other parties in Finland’s parliament have signaled they don’t want to join a government with the Finns, because of the group’s strident nationalist agenda. But that could change given the tight election result. Rinne says he wants to finance more spending by raising taxes. The party will have to square that with slowing economic growth and the need to create at least 100,000 new jobs over the next four years, in order to offset the impact of an aging population on public finances. Other parties on the left of the spectrum also had big gains. The Green League posted a record showing as a counterpoint to the Finns Party, amid a heated debate over climate change. One potential government partner for Rinne is the National Coalition, though joining forces would require him to compromise on his planned tax hikes. The National Coalition led a government with the Social Democrats ahead of the 2015 election and has been part of all ruling coalitions since 2007. Sipila has not ruled out being part of a coalition led by the Social Democrats.